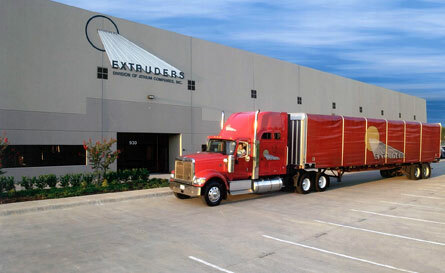 We are please to announce the acquisition of Extruders Inc.
DALLAS – Atrium Corporation, one of the largest manufacturers of vinyl and aluminum windows and patio doors in North America has announced the sale of its aluminum extrusion business, Extruders, located in Wylie, TX to Tower Extrusions, LTD, an industry leader in custom extrusions since 1977 based in Olney, TX. Tower Extrusions LTD is a privately held company established in 1977 and is a leading supplier of custom aluminum extrusions, fabrication and finishing services. The company serves the building and construction, transportation, consumer durable, electrical, machinery, and distribution markets. Tower has over 12 acres of under-roof manufacturing facilities including a state of the art cast house, 5 extrusion presses, one of the largest production anodizing lines in the United States, and 144,000 square feet of in-house fabrication. For more information on Tower and its capabilities, visit www.towerextrusion.com. For more than 60 years, Atrium Corporation (atrium.com) has offered the highest quality window and door products to builders, contractors and distributors in the residential construction industry. Dedicated to meeting the needs of its customers, the Atrium family of brands provides a versatile range of window and patio door products, including vinyl and aluminum models, as well as replacement and new construction product lines. A variety of window styles also is available through the Atrium family, including single- and double-hung, horizontal slider, casement, tilt-and-turn and architectural shapes. Specialty products are also available including hurricane-impact solutions with Atrium’s SafeHarbor® impact-resistant windows and patio doors. The company’s portfolio of brands includes its flagship Atrium Windows and Doors brand and North Star Windows and Doors. For more information on Atrium and its quality window and door products, visit www.atrium.com.